For a business that relies on the Internet, slow connection speed can mean lower productivity and reduced profitability. The speed of your Internet connection depends on a number of things, including the type of connection you have, the number of people using it, what they are using it for and the way your system is set up. The following is a brief guide that highlights some of the factors that might be slowing your Internet down and offers some suggestions on how you can deal with them. In order to increase your speed, you first need to know what that speed is. Have your IT department run a speed test on any of the online sites that are set up to do this. Once you know what sort of speeds you are getting, you will be able to tell whether any changes you make are effective or not by running a second speed test. If you are using WiFi in the office, interference from nearby electronic devices can slow the signal down. Try relocating devices such as printers, faxes and copiers to a different area of the office or a separate room. Structural obstacles can also interfere with WiFi signals. Your router should be located in as central a position as possible, away from obstacles such as walls, staircases and pillars. Viruses and malware not only destroy computer networks, but some can slow them down considerably as well. Scan your whole network for viruses and malware and remove any you find, especially cookies, which can be running in the background and using up precious bandwidth. Strange as it may seem, the more cables you use and the longer they are, the slower your network will run. Try moving devices closer to their connections and installing shorter cables to see if your Internet speed improves slightly. 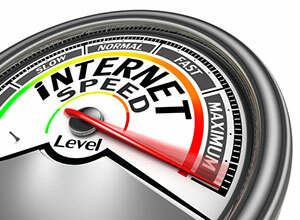 Another reason for slow Internet speed may be that you have more users than your bandwidth can cope with. Solutions might include restricting activities that consume a lot of bandwidth for set times in the day or setting up a second WiFi network for half of your employees. You could also investigate moving to a business plan that offers higher Internet speeds. Another way your WiFi network can be slowed is if someone else is using it. Make sure your WiFi range is within the confines of your office, or you could have a neighbouring business enjoying free Internet at your expense and eating up your bandwidth. This can also be a security risk, so test the range of your WiFi and adjust it if necessary. The reason your Internet is running slowly could be as simple as old or faulty hardware. Modems, routers, plugs and connections all wear out over time, so if you haven’t had a hardware upgrade in a while this may be a simple solution to your speed problems. As well as hardware, check the software you are running on your network. Many programs have features that run by default which you may not necessarily need, so identifying them and turning them off could also make things run a bit faster. The most effective way to increase your Internet speed is to change to the fastest type of connection available. ADSL2+ with speeds of up to 24Mbps is the best you can get using ADSL, so you might want to consider upgrading to fiber optic broadband instead. This is up to five times faster than ADSL, offering speeds of between 30Mps and 150Mps and it is also much more reliable and stable and much less susceptible to electrical interference.